Shareholders of First Cobalt – FCC-TSXv/FTSSF-OTCQB are like the Fram Filter man – they can get paid now, or they can get paid later. I think they could get paid now because FCC owns the only cobalt refinery in the world that’s idle – outside of China, up in the small town of – where else – Cobalt Ontario. It’s permitted, and has been independently appraised as being worth USD $80 million – which would be $104 million in our discounted Canadian dollars. Compare that to the company’s market cap of CAD$43 million. CEO Trent Mell believes that for a $30 million investment… this refinery can be quickly cranking out $25 million in cash flow at a USD $30/lb cobalt price – that’s just over a one year payback. Even at current prices that are bouncing around $20/lb (and viewed as unsustainable) the payback on getting this refinery up and running is just two years… a no-brainer kind of return. I tell all my OGIB subscribers – juniors in oil and gas must have one year payback on their assets for them to grow within cash flow. Oil wells decline quickly. But this refinery will keep on chugging out huge profits year after year with no decline. USD $30 per pound is the consensus analyst view for medium term cobalt pricing although some analysts see quite a bit higher. A lot of mining projects go into production with just 15, 20% IRR. This refinery is going to have like 100% IRR – 50% in the worst case. adds an incredible amount of intangible value the Market isn’t pricing in. Investors aren’t recognizing this, but the American government is. They put out a personal invitation for CEO Trent Mell to visit the White House in Washington D.C. to help them better understand what the US could do to secure a domestic supply of cobalt – as they have a growing deposit in Idaho. That’s what I mean by shareholders getting paid later. Getting the refinery into production ASAP would pay shareholders now – getting the Idaho asset developed & ready for mining – with the strong backing of the US government – means they get paid later. The US government is clearly concerned about domestic supply of critical minerals – including cobalt. So when Mell told me he took a trip to the White House for a conversation with the President’s national security advisers – I wanted to speak with him right away. It isn’t every day that I get to speak with someone who has done that! The obvious question is why is it that the White House is interested in a $50 million company like First Cobalt? Well, it is for the same reason that Simon Moores of Benchmark Mineral Intelligence appeared before the US Senate Committee on Energy and Natural Resources last week – the US Government is quickly figuring out that the country is heading towards a major problem. The US is woefully behind in getting ready for the future of transportation – Electric Vehicles. During his testimony Moores revealed that he is now tracking 70 lithium ion battery megafactories under construction across four continents. Forty-six of those are based in China with only five now planned for the US. When Moores last provided testimony to the Senate in October 2017 the global total was at 17 – so it has increased fourfold in 15 months globally while nothing has happened in North America. Because right now it looks more and more like the 21st century will belong to lithium ion batteries. The power in the auto and energy storage industries is going to belong to those who control both the raw lithium ion battery materials and the manufacturing know how. China is miles ahead in securing the supply of lithium, cobalt, nickel and manganese to produce lithium ion batteries. 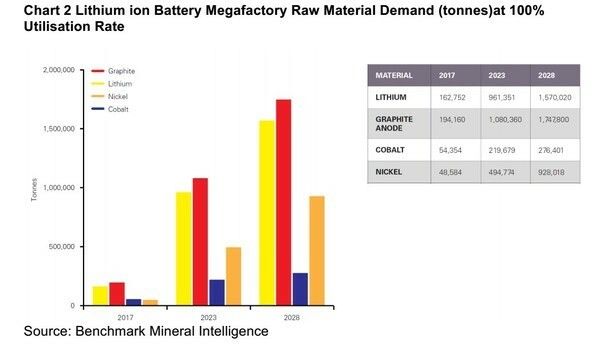 As of today the US has a minor to non-existent role in most of the key lithium ion battery raw materials and only has a presence in lithium ion battery manufacturing via Tesla and its Gigafactory. The U.S Government is recognizing that country is almost comically behind in this critical race… and that this has to change and it has to change fast. Cobalt is a critical safety component of the lithium ion battery. The US currently has virtually no control over the entire cobalt supply chain. Mining of cobalt is dominated by the Democratic Republic of Congo (DRC)… YIKES!! Refining of cobalt is currently dominated by China which is increasingly looking like an enemy of the US. When it comes to cobalt the US currently has nothing… NOTHING! China has locked down the supply from the DRC and has developed the refining capacity of its own. Developing domestic cobalt supply and refining capacity is nothing less than a national security issue for the United States… hence the reason that First Cobalt’s CEO Mell found himself at the White House speaking to the President’s National Security Advisors. The Government seems to now see the problem. The good news is that the US has an opportunity to develop its own domestic supply of cobalt. It just needs to get moving to do it. The Idaho-cobalt belt is globally known as being a cobalt rich jurisdiction and presents one of the few opportunities for US cobalt supply security. It was most certainly First Cobalt’s important Iron Creek cobalt project in Idaho that had CEO Mell visiting the White House. That huge asset will definitely be First Cobalt’s long term driver. But that’s where FCC shareholders get paid later. Where they likely get paid now is First Cobalt’s $100 million Ontario refinery that has my short term interest… both for the fact that it is hugely mispriced in the market today but also for the economics it offers. First Cobalt last reported $11 million of cash in the bank and no debt so they can get this refinery producing cash flow with a reasonable debt financing. Or… somebody smart figures out that this unique asset is selling at a third of replacement value in the market and takes this company over before the market corrects its absurd valuation mistake. Internal Rate of Return (IRR). It and Net Present Value (NPV) are the two most commonly used investment analysis methods in the oil & gas industry.